All posts with Color "Navy Blue"
Welcome back, Maharanis! 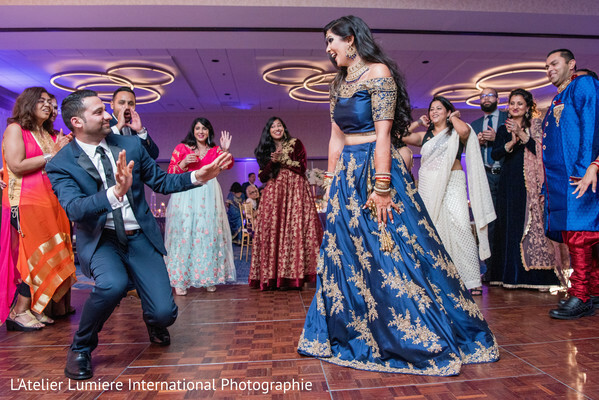 Now we join Debarati and Niraj at their incredible wedding reception at the wonderful halls of the Hilton Clearwater Beach with all the beautiful photos caught by L'Atelier Lumière International Photographie! 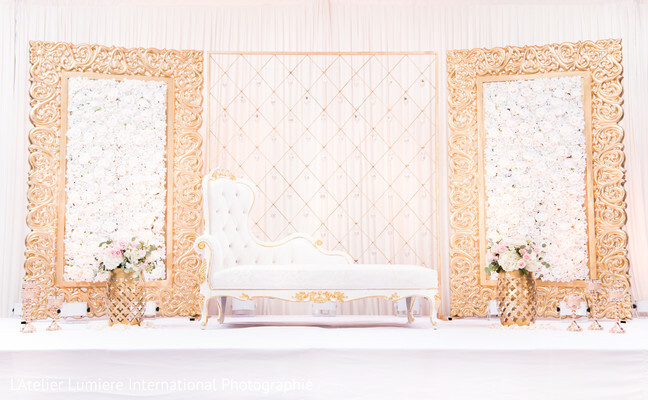 The glam bash decor was made by Maharani Designs and included two dreamy panels of white flowers perfectly built inside two majestic frames all in white and golden hues. 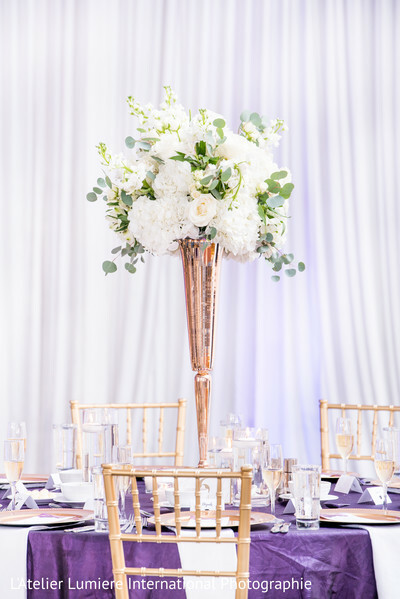 Meanwhile, the tables were covered with bold purple linens and tall floral centerpieces. 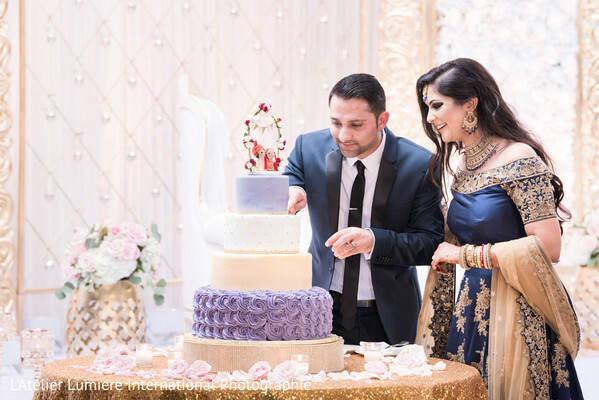 Chantilly Cakes created a four-layered wedding cake decorated with an adorable Indian couple topper and the sought - after wedding entertainer, Pavan Events, played the best Bollywood music to kick off the party time! 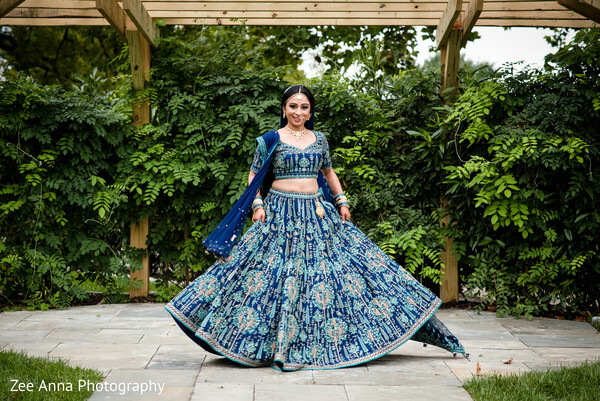 The queen of the night, Maharani Debarati flaunted a glorious blue evening ensemble and long, loose wavy hair, a complete hairstyle creation of Sumaiya Waheed and Michele Renee The Studio. 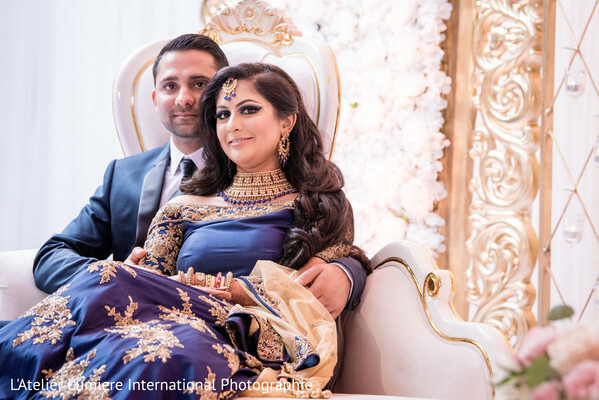 Her choker necklace made an absolute statement while her soulmate and new beau Niraj also nail it with an elegant blue and black lapel suit! 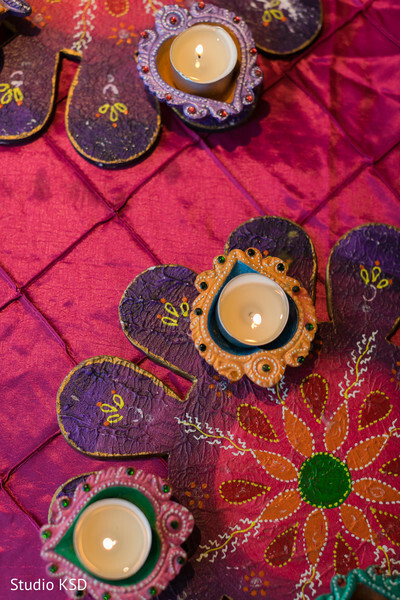 We have all the pretty details in the gallery just waiting for your inspection! 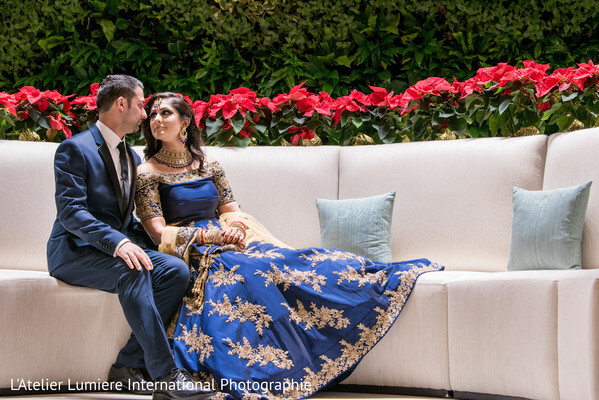 I met Neal through the Coffee Meets Bagel app! 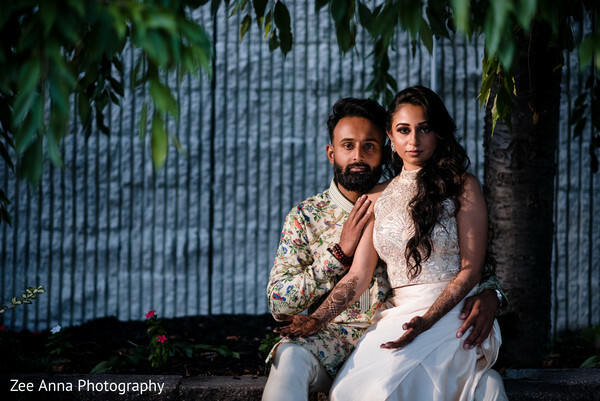 We both work in NYC, so we would meet up after work and go on dinner dates. I knew he was "the one" on one of our early dates when he spent half the night making a picnic for us from scratch! He had been paying attention to my favorite foods and made a very thoughtful and personal meal and even brought me my favorite ice cream! I was one of those kids who grew up dreaming of being an astronaut, and Neal has spent a lot of time with me in space museums. So it was perfect that Neal proposed to me in a planetarium under the stars! He asked the planetarium to play my favorite song and had the words "Will You Marry Me" projected into the stars! He also had all of our close friends hiding in the audience and it was such a treat to have them there. 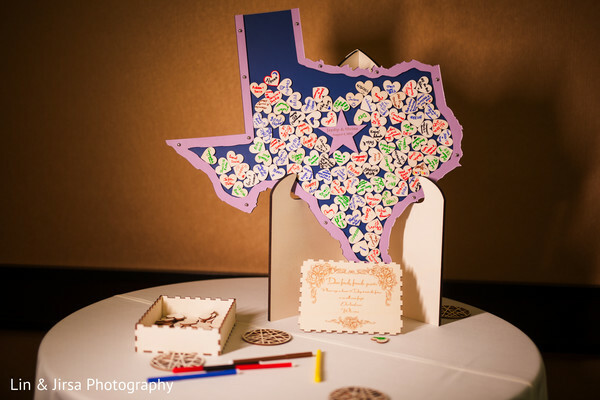 Neal and I knew that we wanted our wedding to incorporate a lot of things that were near and dear to us. 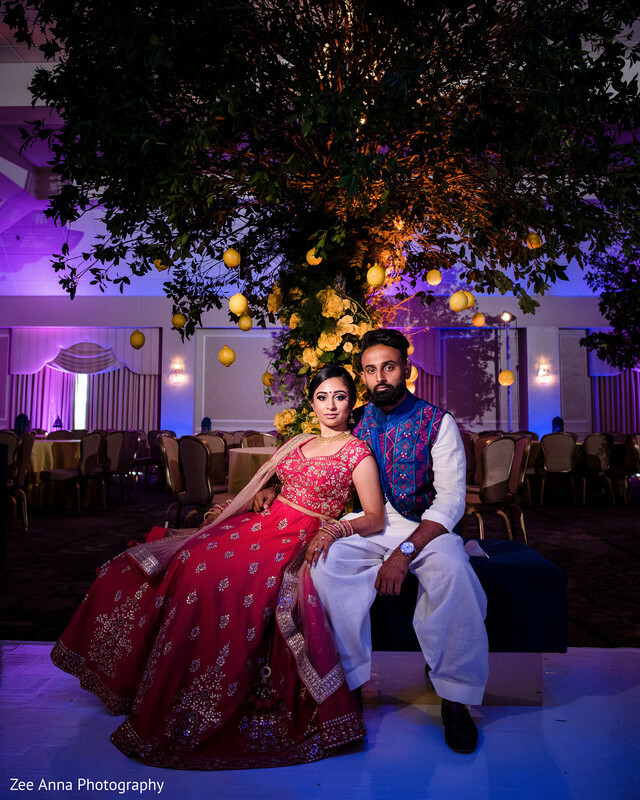 We had our dream venue, but we needed help getting the rest of the details in place. 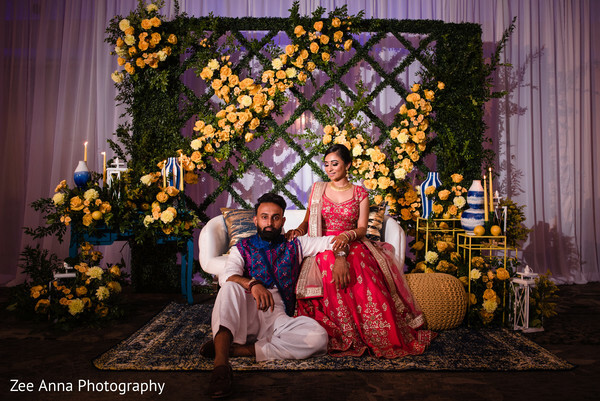 My wedding planner, Sokha from Apsara Events, was instrumental in helping me connect with vendors and making sense out of my decor ideas. 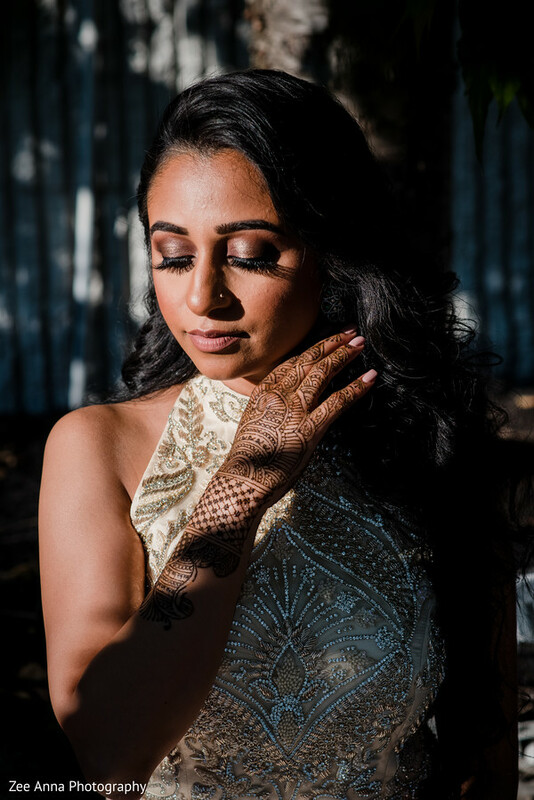 I found my makeup artist (Sumaiya Waheed) through another Florida wedding on Maharani Weddings, and my mendhi artist (Amrita Henna) through Instagram! 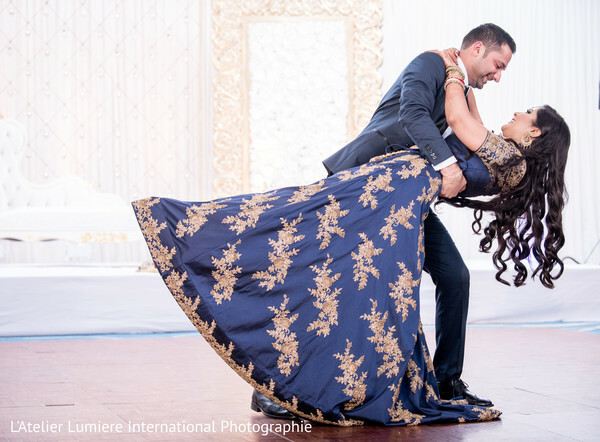 Our photographers (Latelier Lumiere) and videographers (Riant Films) had such delightful personalities that it was super easy to work with them and have fun with our photoshoots! 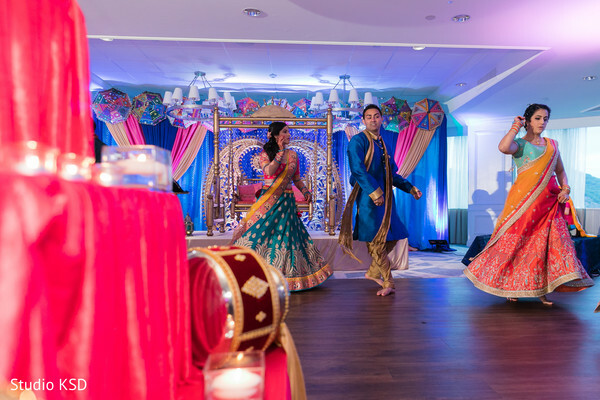 Our guests are still talking about our DJ (DJ Pavan) because he had such an upbeat vibe! 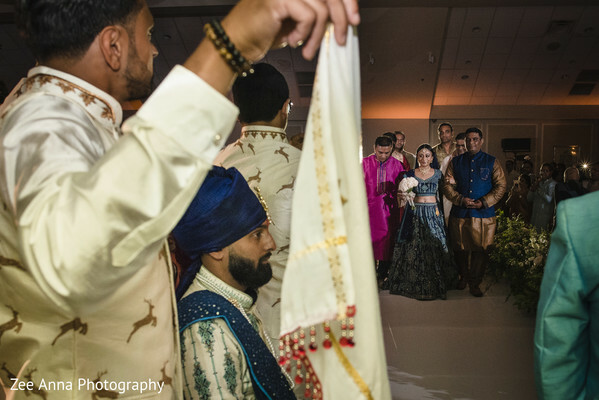 Although I was a Bengali bride, I knew I didn't want to wear a sari. I did, however, want to wear a traditional red outfit. 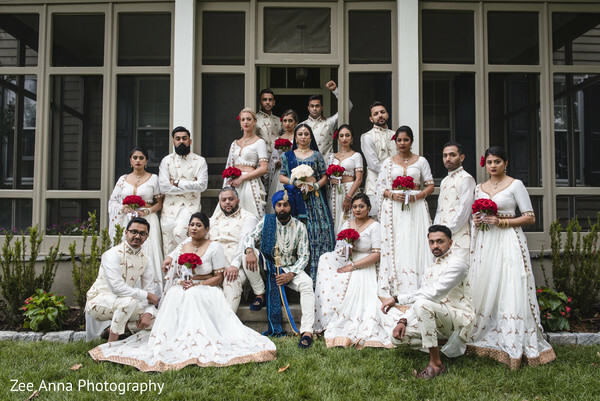 I worked with the team at Nazranaa in New Jersey, and picked out a beautiful red lengha with antique gold floral detail. 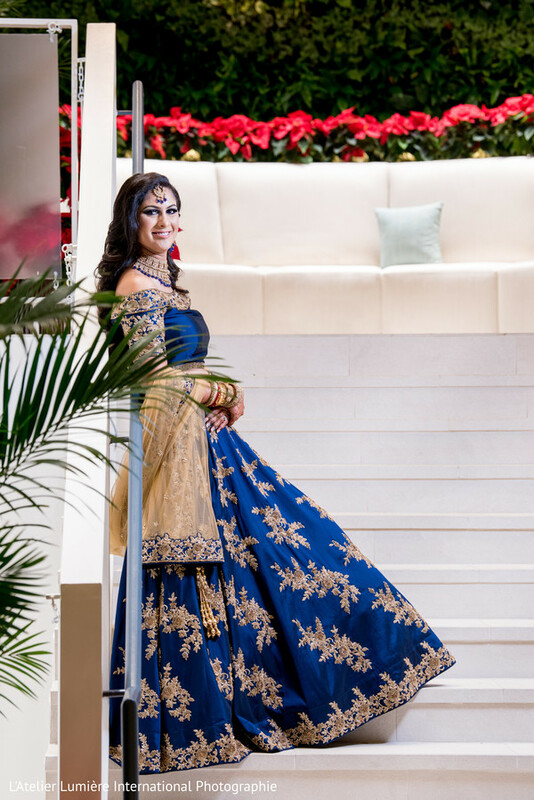 I really loved my wedding outfit, and felt extremely comfortable in it on my wedding day! 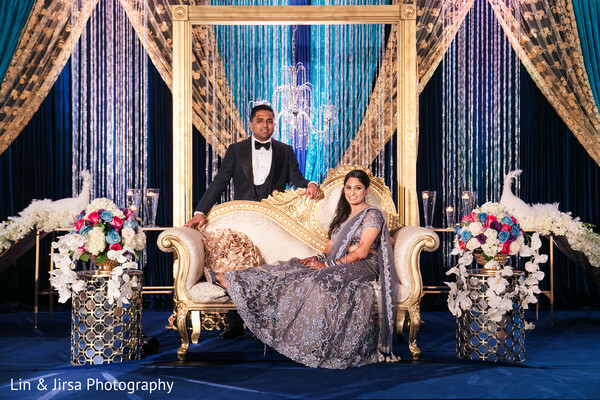 The team at Nazranaa also helped me design an amazing reception outfit! The most enjoyable part of the planning process was getting to spend a lot of time with my brother! 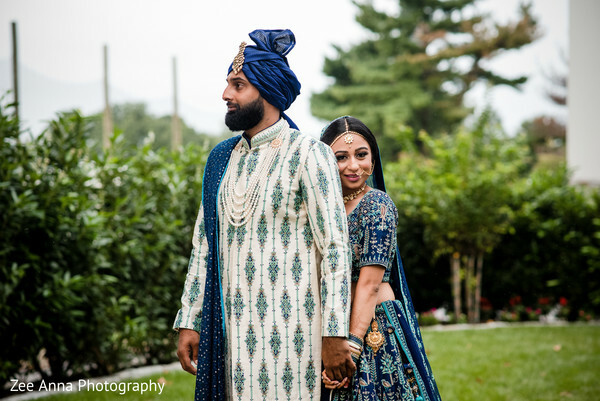 He lived near our venue, so his house was our home base for a lot of our planning process. 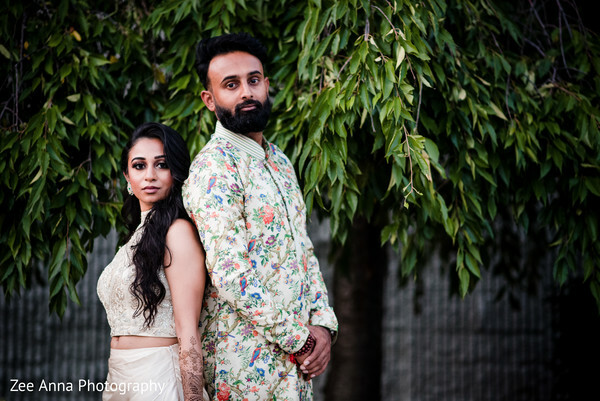 It was also very enjoyable to get to spend some time with our planner and photographers outside of our usual wedding chores! 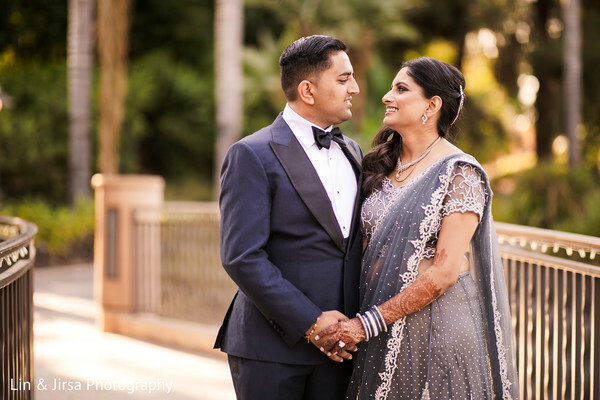 Our wedding weekend timeline was pretty relaxed, so our guests had the opportunity to go to the hotel spa, relax on the beach or in one of the Hilton's swim up bar pools, and do morning yoga on the beach - and they took advantage of it all! 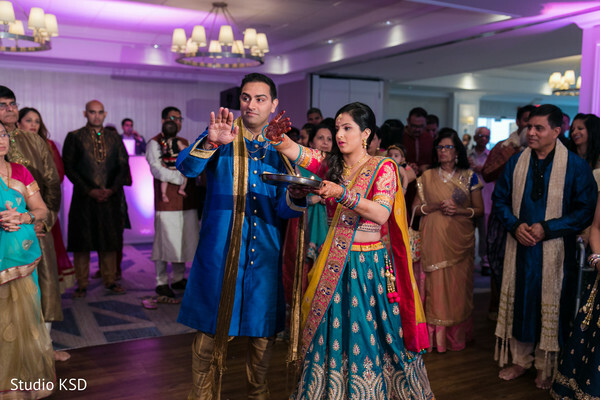 We loved that people were able to have a little vacation while also celebrating with us! 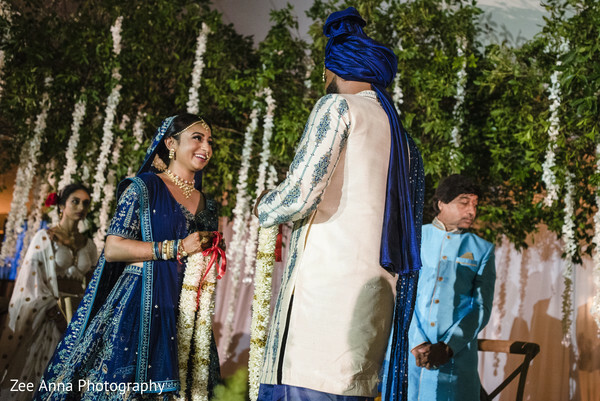 There was a moment before our formal "Mr and Mrs" introduction when we were waiting and were very nervous about performing our choreographed first dance. 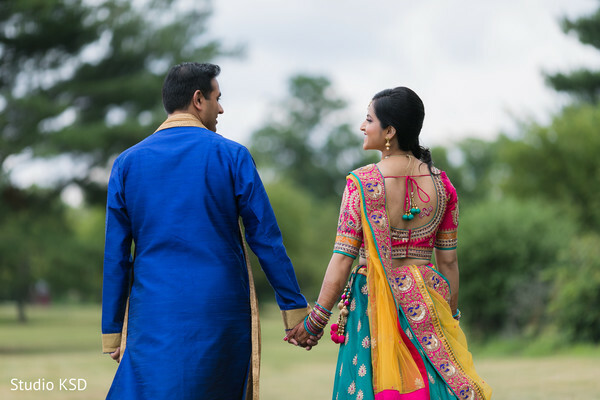 The attendant at the gift shop saw us practicing in the hallway and told us about her and her husband's love story and gave us the confidence to get through that dance! 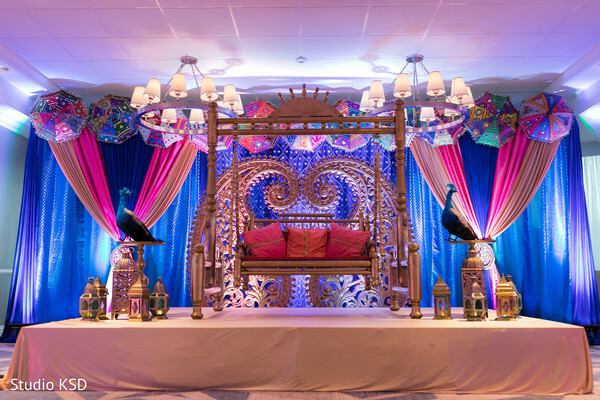 For our sangeet, we went with a non-traditional theme of "A Night Under the Stars" (which matched our invitations!). 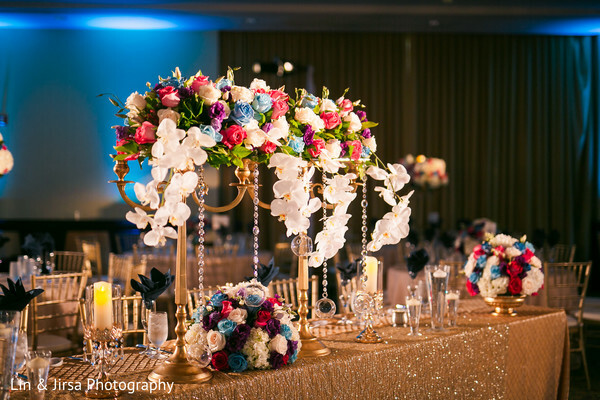 We had our dance floor on the beach with star string lights overhead, and fairy lights as our table centerpieces. 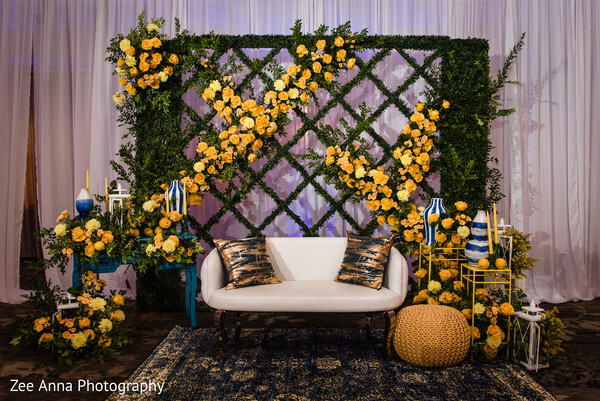 The style was beach casual (we served tacos!) 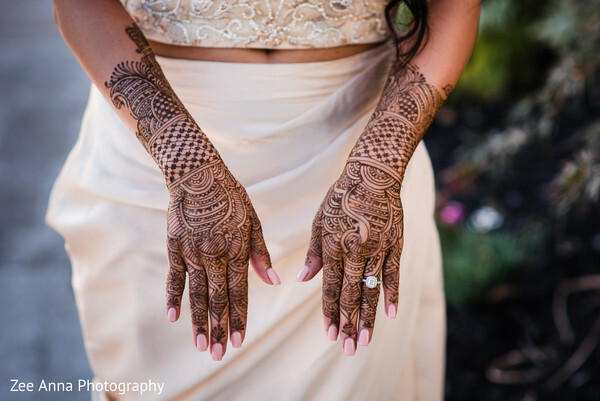 mixed with a touch of elegance. 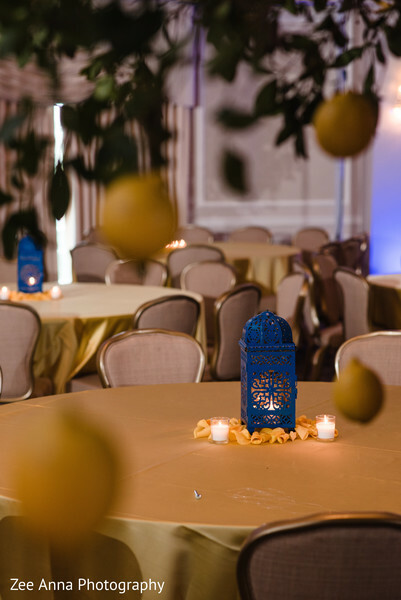 For our reception, we went with a very romantic vibe. 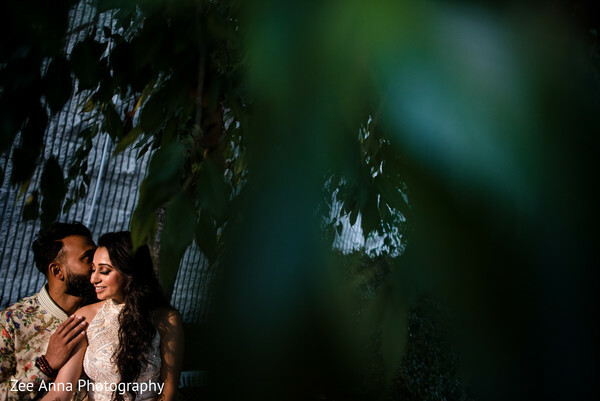 There was a lot of light and touches of gold, blush, and greenery. 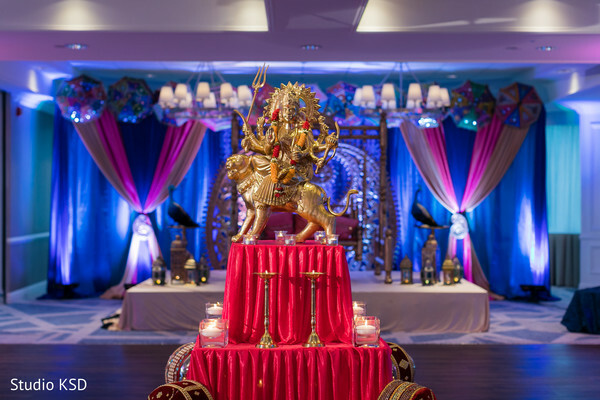 Our decorator (Maharani Designs) brought my visions to life and I was speechless when I walked into each event! Firstly, take care of yourself! 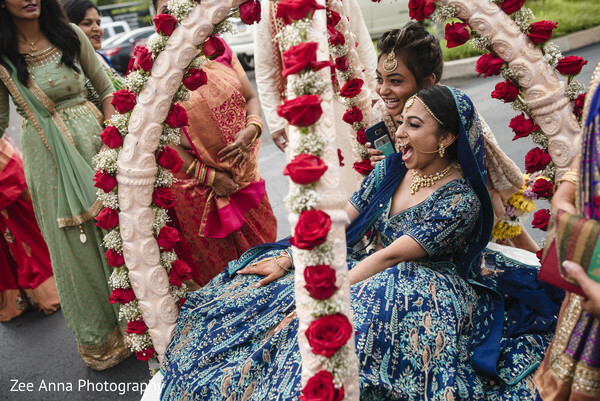 Being a bride is like having a second job, so don't forget to take time to relax. Also, go out of your comfort zone and talk to guests other than your close friends. Many of them may be your parents friends, but this is the perfect opportunity to get to know them, and for them to get to know a little about you! Plus it'll make your parents happy! 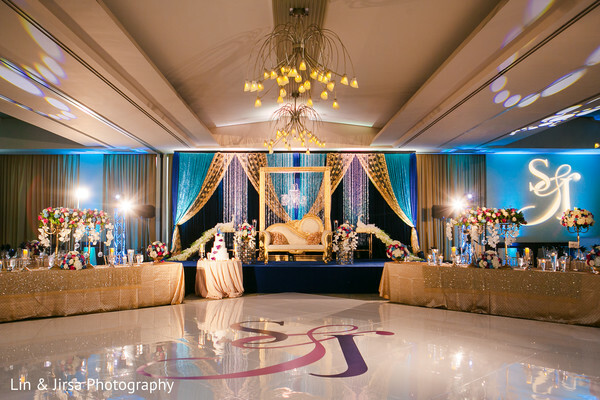 My husband and I picked our venue because of our previous vacations at Clearwater Beach. 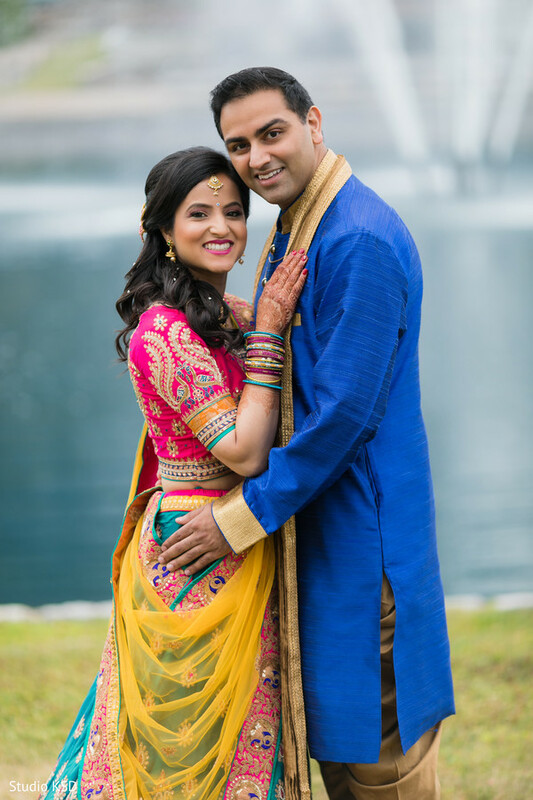 My brother lives in Tampa and we always had a great time in the area, so we knew our guests would as well. The Hilton Clearwater Beach was actually my favorite venue before I even met Neal! Being on Clearwater Beach just elicits a sense of calm and happiness from me and I wanted our close friends and family to be able to share that feeling! 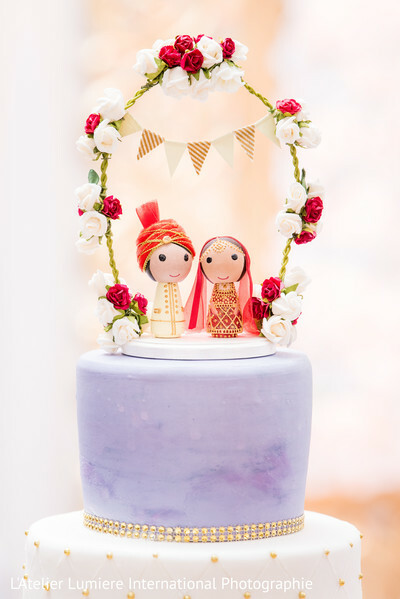 Maharanis, please check back tomorrow for more wedding inspiration! 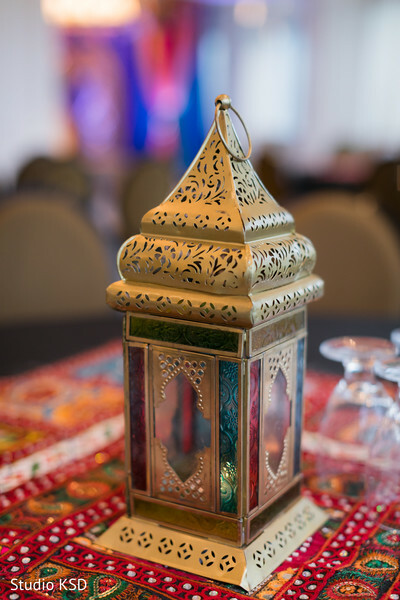 Pavan Events, Michele Renee The Studio, Hilton Clearwater Beach and L'Atelier Lumière International Photographie are members of the Platinum Guide. Love what you see? Explore their portfolios. Hello, loves! 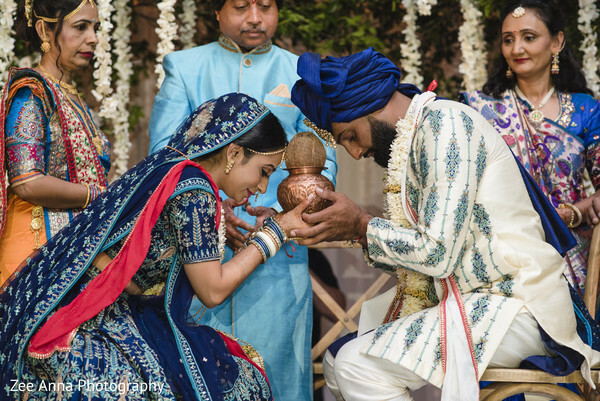 To complete today's Wedding Video Blog we continue with an extraordinary set of detailed images from Maharani Komal and her Raja Parth that takes us for a ride through the wedding festivities. 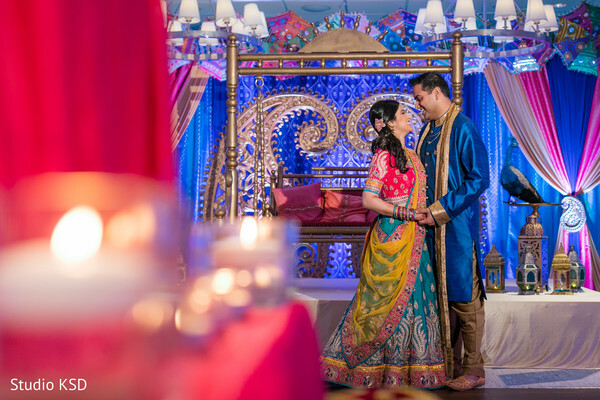 After a formal outdoor photo session with the charming duo, the photo team of Studio KSD snapped more images of the soulmates indoors the splendid Sheraton Mahwah Hotel, which was the venue picked to begin with a colorful night of Garba Raas dance that kicked off their happily ever after. 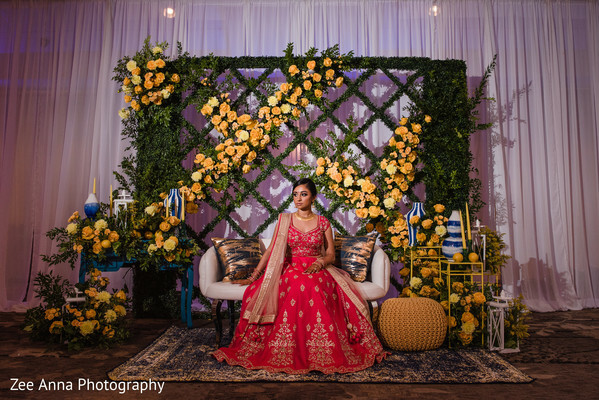 The room was a sea of colors thanks to the vibrant decorations provided by Nirali Decor that decked the space with a lively theme! 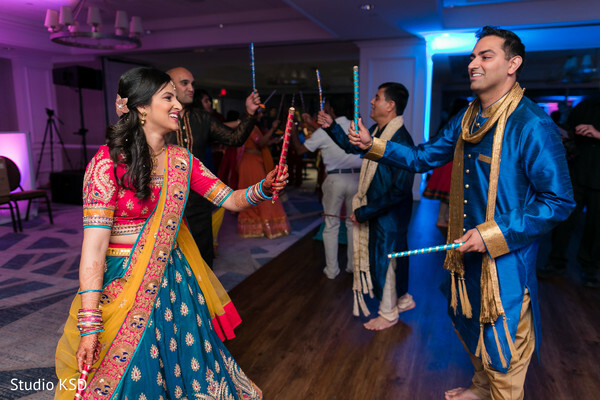 Beautiful drapery fanning out and traditional props scattered all over the place and a magnificent Jhula were just a few of the many elements that created a joyful ambiance for the traditional Dandiya Stick Dance night! 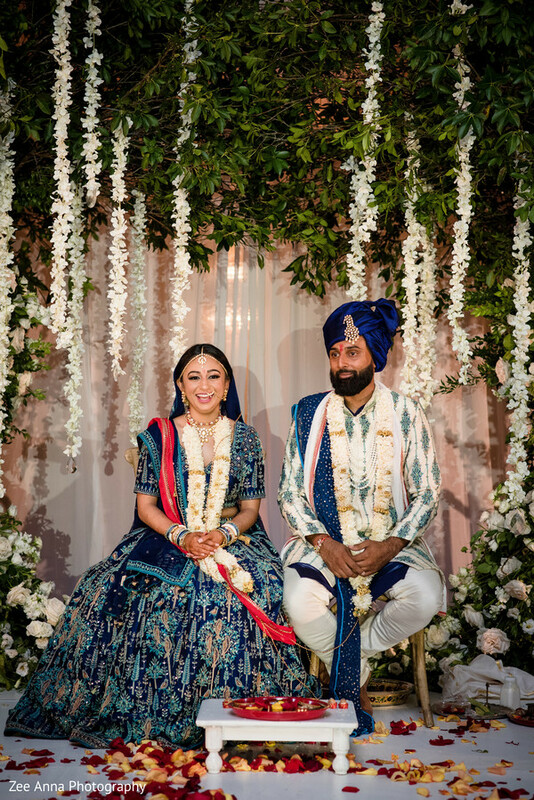 Dressed in equally cheery colors, Maharani Komal donned a teal color lehenga skirt, and a fuchsia color choli that she paired with a yellow dupatta, her over-the-shoulder hairstyle created by Makeup by Shaili gave her that extra touch of playfulness to the entire look! 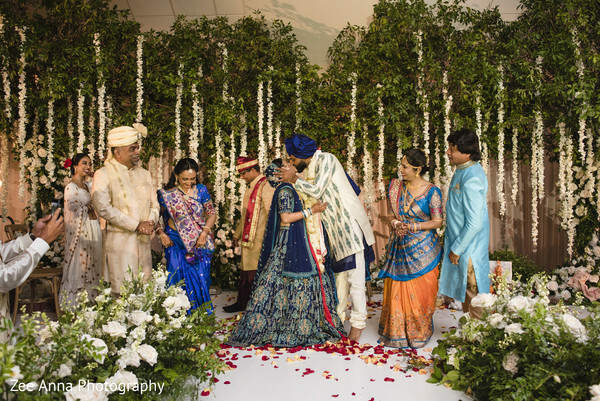 Scroll down and go over the lovely images of their first grand event and visit our full gallery for more inspiration! 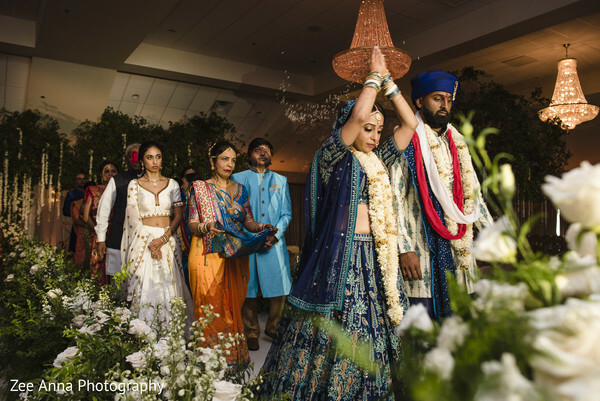 In our following feature, we will go inside the grand ceremony! Join me. 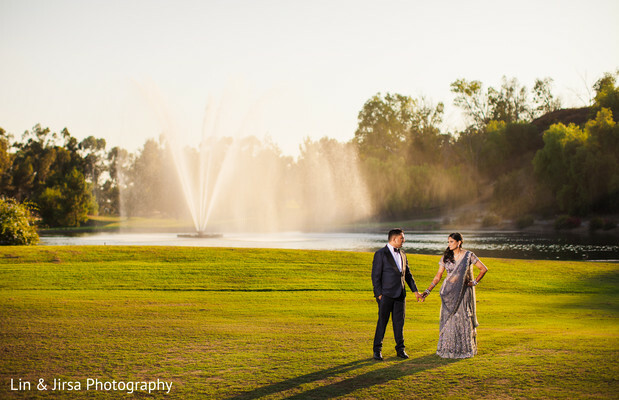 Shrina and Jaydip took on the night at the elegant Pacific Palms Resort! 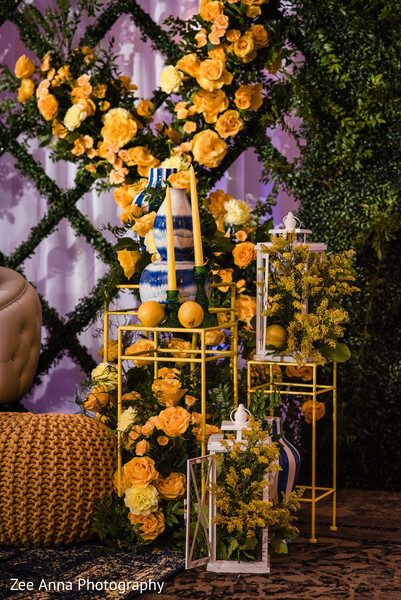 This beautiful venue burst with some seriously inspiring decor thanks to the brilliant floral centerpieces designs that Deepti's Florals Designs & Mandaps created for the last event! 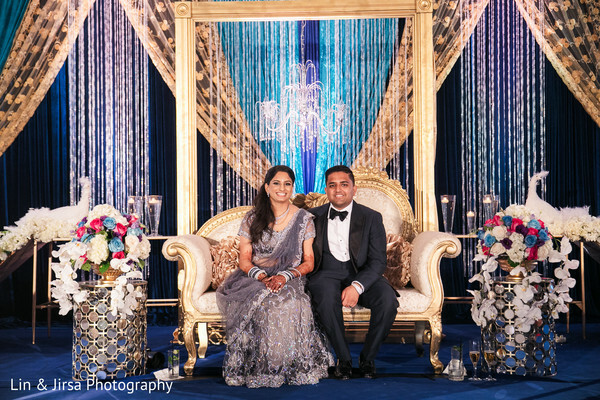 Besides the table splendor, the wedding stage also exuded personality with two beautiful white peacocks that completed the crystal beaded curtains and chandelier that created the perfect sparkly backdrop! 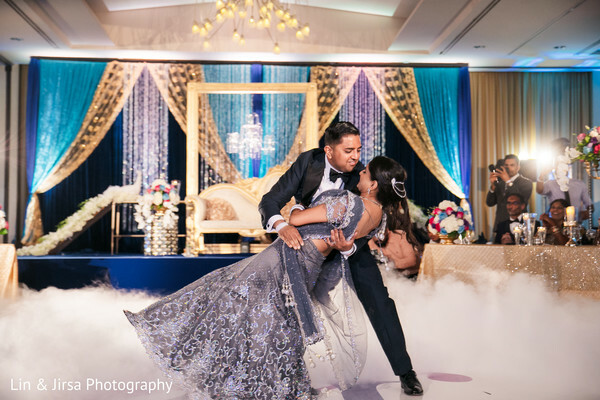 After a magic photo shoot during the golden hour, Lin & Jirsa Photography snapped the lovely newly married twosome on their love seat and twirling all over the dance floor with the music of the best wedding DJ, the great Fusion Sounds! 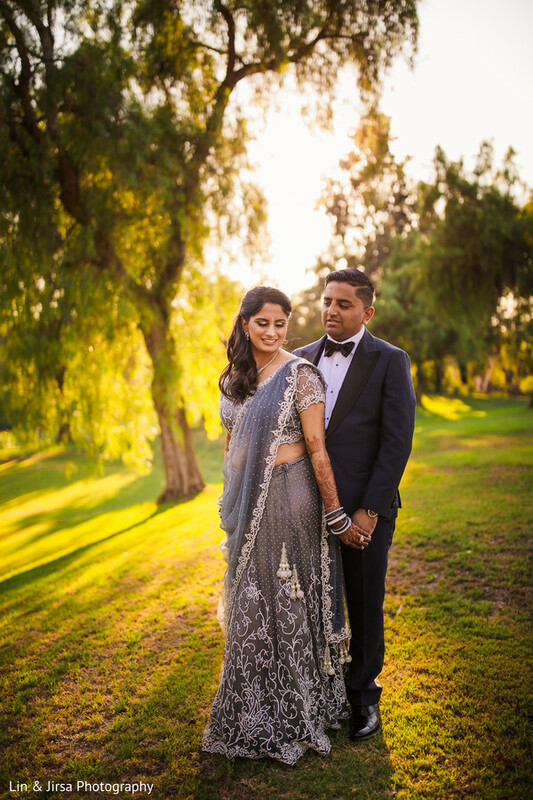 Maharani Shrina wore a silver lehenga embellished with some dazzling paisleys and opted for a graceful hairstyle and a stunning evening makeup by Dolled up by Lulu! 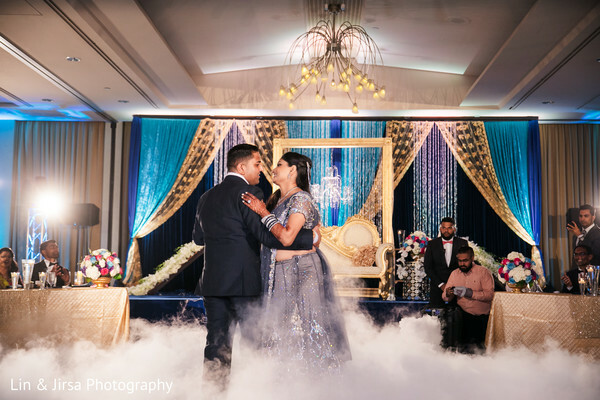 Platinum Dream Events made sure our adorable Mr. and Mrs. celebrated their Indian affair in style, perfectly planning an incredible reception filled with enchanting glamour! 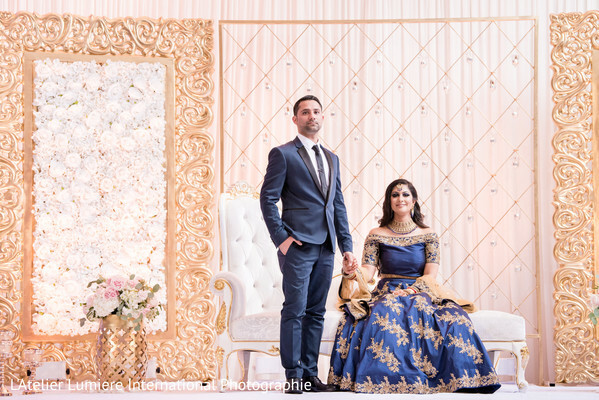 Take part of this enchanting soiree visiting our previous feature with the complete highlight footage by Regal Palette Studio and our full gallery now! 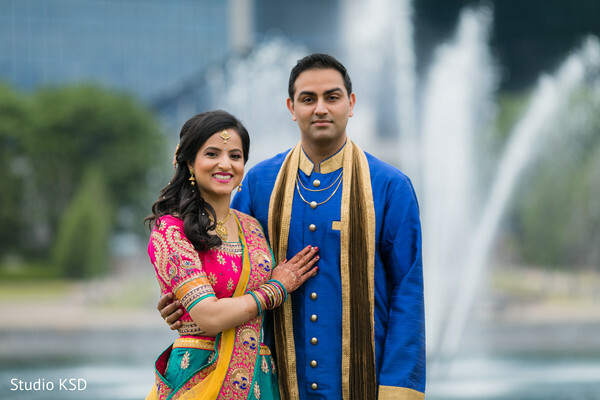 See you all tomorrow with more grand Indian affairs!